The South Fork of the Salmon is revered throughout the Pacific Northwest and beyond. It supplies habitat for threatened and endangered fish, as well as some of Idaho's best expert-level whitewater. It is also a candidate for inclusion in the National Wild and Scenic Rivers System. Idaho is known for more than its beautiful rivers, however. The demand for Idaho’s precious gems and heavy metals continues to threaten the state’s public lands and rivers. A proposal to resurrect a mine in the South Fork's headwaters puts this one-of-a-kind resource at risk. In fact, American Rivers found the South Fork of the Salmon River to be one of America’s Most Endangered Rivers in 2018. Why? The potential for destructive, catastrophic mining. Sense of place is about finding connection in the world. The people pictured and quoted here have nurtured an intimate connection with the South Fork of the Salmon River, a place threatened by new mining activity at its headwaters. 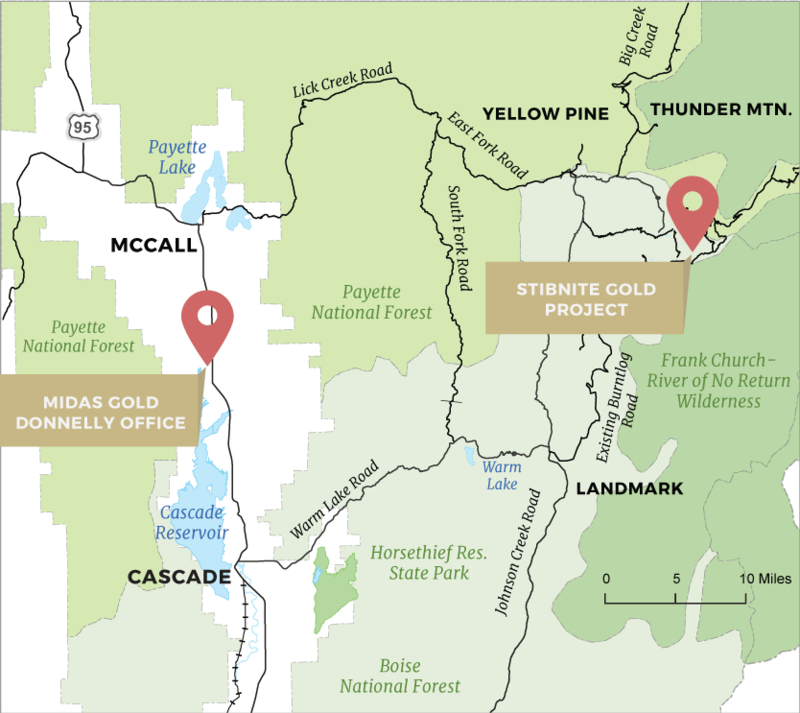 The Payette National Forest on February 2 released a summary of the 536 public scoping comments it collected regarding the Midas Gold Stibnite Project. A majority of comments expressed concern. A noteworthy percentage highlight serious apprehensions for environmental quality, human health, and wildlife and species conservation on the forest. Fall Creek Rapid on the South Fork of the Salmon River, one of the river's outstanding Class V rapids. Photo by Scott Acker. Midas Gold Inc. is a Canadian company that has Idaho offices. While people who work at Idaho locations are generally, Idahoans, the company still holds its roots in Canada. Midas Gold Idaho is comprised of seven board members and almost 30 team members, those strictly dedicated to launching their, Stibnite Gold Project. Scouting on the South Fork of the Salmon. Photo by Nick Hinds. Dogs enjoying the clean water of the South Fork of the Salmon River. Photo by Nathan Stewart. Midas Gold is approaching their massive proposed project from an angle different than that of previous mining companies in Idaho. For instance, their Plan of Operations, is the Plan of Restoration and Operations, highlighting their claim to fame, "Restore the Site." This slogan is printed on anything associated with the Stibnite Project, and is truly what sets Midas apart. Even with promises of restoration and reclamation, at the end of the day, Midas Gold is still a mining company, and their main interest in Stibnite is not to restore the site, but to mine it for gold. The Stibnite area, while not technically listed as a Superfund site, can be found on the Environmental Protection Agency's Superfund website. Millions of dollars and years of work have already been dedicated to restoring this area that suffers from legacy mining impacts. The EPA, Idaho Department of Environmental Quality and U.S. Forest Service have all contributed to extensive wetland, stream, tailings and waste rock reclamation in the heavily mined Stibnite area. There are two massive open pits on site, both remnants from extensive historic gold mining. The Yellow Pine Pit, a popular recreation destination for locals to fish and camp, is the main focus of Midas's work for two reasons. First, it is where the highest concentration of gold is located, so the pit will substantially expand from its current size. Second, the pit currently captures the East Fork of the South Fork of the Salmon River. By reopening the pit, Midas says it will eventually be able to return the river to its original channel once mining has ceased. The second existing open pit is the West End Pit, which sits high above the Yellow Pine Pit. Midas's plans include adding an additional and massive open pit, the Hangar Flats Pit, which would make the footprint of the entire project gargantuan. The third pit would be dug in Meadow Creek, an area that has already been reclaimed and restored by the Forest Service and EPA. In addition, Meadow Creek is currently productive spawning habitat for chinook and resident habitat for bull trout. All ore will be processed on site using cyanide leaching processes. Midas plans to reprocess all of the legacy tailings and waste rock. Waste rock and tailings will be deposited in the historic tailings site at Stibnite. Again, the footprint of this project is massive. Midas's plan of operations is titled Plan of Restoration and Operations, indicating the company's intent to "Restore the Site." One of the major components to this effort is putting the East Fork of the South Fork into a 0.8-mile-long tunnel that will channel the river away from the Yellow Pine Pit. The tunnel will include riffles, pools, other simulated river hydraulics and artificial lighting designed to simulate night and day. Midas all but guarantees that fish will use the tunnel to regain access to historic habitat. Meadow Creek and wetlands restored within the project area. This previously-finished reclamation work would be removed to make way for a new pit called Hangar Flats. A map showing the location of the Stibnite Gold Project. The citizens of Idaho and, in particular, central Idaho are very concerned about the impacts an expanded Stibnite gold mine would have on the river and surrounding public lands and communities. Hundreds of people say they love the river for its pristine beauty, challenging whitewater, wild fishery and remote character. Click here to read stories and view photographs from the People of the South Fork. Any action that compromises water quality or threatens endangered fish is of concern. Mining is inherently destructive to the natural environment. The scale at which this intensely intrusive activity takes place is determined by size, mining mechanisms and location. The Midas Gold Stibnite Project is of a colossal scope not often proposed. The mechanisms by which Midas proposes to mine at Stibnite are immensely destructive; open pits are very difficult to reclaim and leave massive scars upon the land. Finally, the location of the mine is dangerous for a number of reasons, mainly being situated in the headwaters of the Salmon River watershed. This means that the Midas Gold Stibnite Project is not only bad for the local environment, but is potentially bad for the entire Salmon River below the confluence with the South Fork Salmon. The River of No Return is the life blood of Idaho, is it worth the risk. We don’t think so. Creeks and streams on or near the site already have high levels of arsenic from legacy mining impacts. Reopening the mining district would lead to more arsenic, mercury and other heavy metals being released into Idaho rivers. The potential for a major leak or contamination event would lead to river water quality compromises locally, but also regionally. Stibnite is located near the headwaters of the South Fork of the Salmon River. Therefore, if there were to be a cataclysmic contamination event, the repercussions would extend to Riggins, Lewiston and beyond. The downstream communities are dependent upon the Salmon River for their economies, and any actions that could compromise livelihoods should be considered dangerous. The East Fork of the South Fork of the Salmon River is productive habitat for endangered and threatened chinook, steelhead and bull trout. While fish have not been able to pass the Yellow Pine Pit on the East Fork, they are present in the river system up to the “glory hole”. In addition, Meadow Creek and other tributaries above the Yellow Pine Pit boast high-quality rearing and spawning habitat for endangered resident bull trout, rainbow trout and other species. The tunnel proposed by Midas is of great concern because there are no actual guarantees that it will in fact be recognized as a viable passage by migrating fish. If Midas leaves the site for any reason and does not see restoration a reasonable conclusion the East Fork of the South Fork will remain in a tunnel until finances are procured to put it back to some resemblance of a natural state. Additionally, if the tunnel is as productive and effective as Midas claims, and fish do indeed use it to travel, the area upstream that they would have access to would be degraded from mining operations. The presence of endangered fish species above and below the site warrants federally mandated precautions and protections. Plans to re-channel and de-water streams are unacceptable actions and directly compromise endangered species habitat needs. Putting a river into a tunnel is objectionable, and would directly compromise habitat for endangered fish. If the project is not seen through to completion, citizens will be left with their river in a tunnel and another costly rehabilitation project. The South Fork of the Salmon River is prized by expert kayakers and rafters. Photo by Nate Ostis. Recreational opportunities on the East Fork and the South Fork of the Salmon River are in question if the Midas Project is permitted. There are no guarantees with mining, other than what we have seen historically, and that is short-term gains with long-term repercussions. All mining companies claim that their actions are state-of-the-art and that they're armed with the best technology. Inevitably, however, contamination arises. The South Fork of the Salmon River is a managed as a suitable Wild and Scenic river. Therefore, it is paramount that water quality not be compromised so that this river can remain suitable to someday join the ranks of other pristine Idaho Wild and Scenic rivers. July 20, 2017 marked completion of the project's scoping period for the U.S. Forest Service. Scoping comments are any and all concerns or praises people, organizations and agencies have with the project. Through the National Environmental Policy Act, the Forest Service has to open proposed projects for public comment. Legally, the Forest Service is bound by the Mining Law of 1872 to permit any mining project on public lands. January, 2018 the Forest Service released a summary of public scoping comments, many of which highlighted major concerns about the project. The Forest Service will be developing a range of alternatives in conjunction with the 536 public comments. New and existing data, proposed alternatives, and impacts from implementing different alternatives, will all be included in a Draft Environmental Impact Statement (DEIS). The scheduled release of the DEIS is May 2019. Once the DEIS is released, there will be another public comment period open for a minimum of 45 days. This is an important part of the NEPA process and people need to read the DEIS critically and provide very detailed and specific comments. The Forest Service will then take those comments and potentially revise the DEIS. Then, the Forest Service will submit their Environmental Impact Statement (EIS) for public review and comment, take all of those comments and submit a final EIS, as a Record of Decision. If organizations do not agree with the revisions and final product of the EIS, they have the opportunity to litigate the Forest Service once the final EIS is realesed. This project is massive and includes many different interested parties. In addition, there is a long, complex history at Stibnite, Idaho. Therefore, we encourage you to be educated. Here are some more resources to help shed light on the Project.